December | 2007 | Stay out of trees! I rode my last century of the year yesterday. I promise. It was a nice bookend to the season of centuries. The first gravel century for me was at the Dirty Kanza where three of us kicked one out in six hours. We were flying. Yesterday I was alone and I was not flying. We had gotten six inches of snow the day before and the paved roads were sloppy. 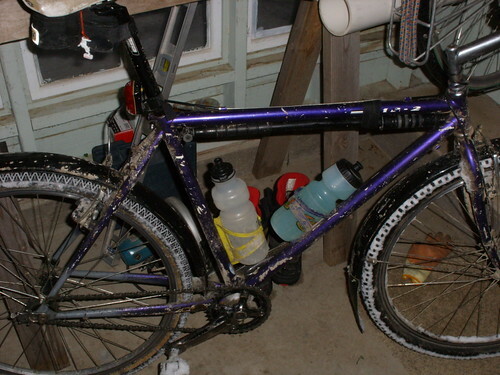 The gravel roads were not, they were snow and ice. 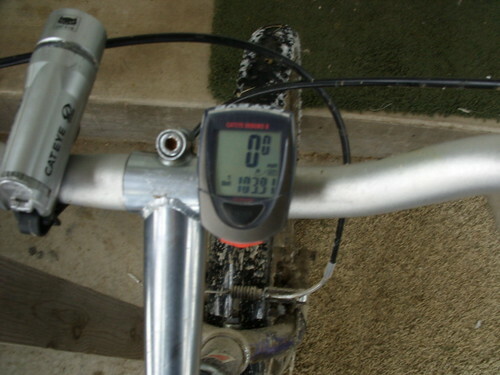 I bet I did not ride even five miles of dirt. Maybe not even one. I left early in the morning and the temperature was twenty-something. I had no plan on where to ride and first turned north. The roads in town were in terrible shape and the cemetery I rode through had not been plowed at all. Slow going. Conditions improved on the edge of town and I was making good time. The first gravel road was hard pack snow and some ice. It was surprisingly fast. I took a nice loop up near Solon and then went out East for some exploring. anticipating some slow sections and was able to keep moving, but just barely at times. The first climb had my computer telling me 4.5 mph! 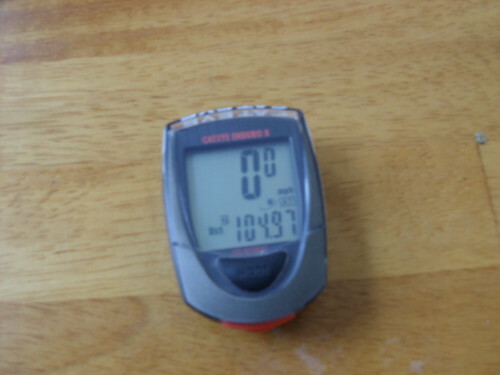 I was happy that I was able to stay on the bike but I started to worry about being able to go the distance on this day. Eventually the road improved and I rolled into West Branch for the usual break with just over 40 miles done. Some loud mouth asked me if I had wrecked much today. Nope, I said, lots of slipping and sliding but no carnage. He laughed and walked off to his warm truck. I rode away and just two miles later biffed it. Crud. I turned South and again the road was in bad shape. Better than the tractor road but soft snow and many drifts. Plodded along, had to clear the road to let a road grater by and in its wake I found decent road surface but still not fast. I was trying to avoid all B roads, which led me to some silly route making between West Branch and Lone Tree. I tried to go to Hills but many roads only connect with a B section or (even worse) pavement so I weaved around and doubled back on myself and got no closer to any stores of convenience but I did finally get that dratted computer to tell me I had ridden 60 miles. I started to believe I could make it then. I was some miles Northeast of Lone Tree and decided to take one more trip over the tri-county bridge and then head for home. The road to the bridge was sketchy, lots of parallel grooves in the hard pack snow and slick, too. It kept me paying attention and I almost crashed a couple of times but it was fast. I crossed the bridge and into another world, the worst road I had encountered so far. Deep snow and just a couple of truck tire tracks. This road has a few curves and it was really hard to keep the bike from sliding sideways. It kicked around a lot, my speed was slow and I had to stop a few times to switch tracks, get out of snow banks, pick myself up after crashing and such. I was thinking this section to Riverside might never get better and would take me an hour. Not to worry, the next turn found me on another road and it was in better shape. ridden further in colder temps but always on pavement. That was a tough ride. 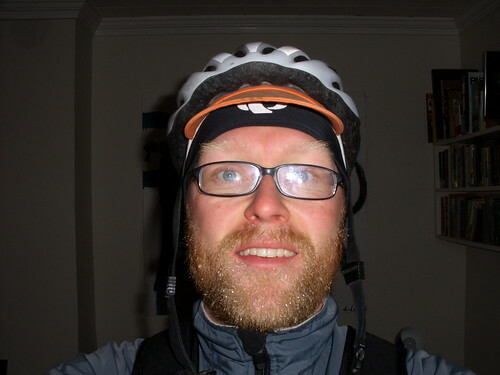 There you have it, twelve gravel centuries in 2007. I rode two in one day in May at the Dirty Kanza, one in August, three in September, one of them on my single speed townie, four in November and two in December on my Bridgestone single speed. I am glad it is done and I am glad to have stuck it out. I look forward to taking that computer off my bike and putting it back in the box it usually lives in. I am looking forward to more “fluid” rides that don’t take all day. I am looking forward to getting my dirt cup. I hope it doesn’t really have dirt in it, I would really just like a cup of coffee. As the cup creator would say, Peace! Left the house Wednesday morning, Dec 26th, at 7:15. Two more gravel centuries required for the cup and just a week left to get them. It has been snowing a lot and in general just being cold and wintry. The skiing is great. And warm. I like it. As I was backing my bike off the porch I biffed it on a sheet of ice that used to be our front step. Swore, threw my bike, etc. Wondered why I was doing this and so on. I rolled out and headed North. It was about 20 or 25 degrees. Hit the gravel and rode up Solon way before turning East. It was cold and the roads were actually in fairly good shape as long as you avoided the glare ice sections. After 18 miles or so I rode onto such a section while traveling down a hill and attempting to stop. I crashed. Continued on and enjoyed the beautiful morning, moon still hanging in the sky to the West and a beautiful sunrise to the East. Turned South and went to West Branch for a quick Casey’s stop. I continued South towards Lone Tree with my usual swerve through Downey. Lots of aggressive doggies today, one bit my rear fender and I had to kick another one in the face to get it to back off. I feel bad about that. Many dogs that gave chase crashed when they left their snowy yards and hit the icy roads. Tee-hee. There was much beautiful snow! Pretty drifts and in some places it was piled up higher than me on both sides of the road. Stopped in Lone Tree for a water refill and bag of chips. geared at 34X16. Went down to the tri-county bridge and headed to Riverside. The B roads I passed were either completely untouched or had seen only snowmobile traffic so I chose to avoid them as the mission for today was mileage. Arrived in Riverside after 70 miles and took my last break. The bank clock told me it was 35 degrees. Back on the road I went West again and North almost to Iowa City before looping back down to Hills. Saw Jean Gilpin of Team Skin fame there and she asked if I was getting my last gravel century, sadly I had to answer no. Always nice to see a friendly face! I was pretty tired but kept it moving pretty well for the last miles. Had to ride a bit out of my way to avoid B roads and still be sure of getting the 80 miles on dirt, which I did. that otherwise I was clean and dry and warm. Fenders work. A front mud flap should improve things, I hope to attach one before my next (and last!) ride. Hundred, hundred, hundred more miles to go, I want to feel elated. So there is this whole big thing going on in Iowa about banning bikes and group rides and who knows what else and there has been some local activity that prompted me to write this letter to our local paper. It was published yesterday. Here it is for you non-paper readers, I hope it helps! I was at the Johnson County Board of Supervisors meeting last week, and I commethe supervisors for their decision to take no action on the Iowa State Association of Counties resolution regarding cyclists use of county roads. This is a clear erosion of cyclists’ rights that is as unnecessary as it is misguided. As a long time bicycle commuter and recreational rider happily living car free right here in Iowa City I thank the Supervisors for their action and urge my legislators to follow their example. Iowa needs to encourage cycling, not discourage it. And let’s get some passenger rail service while we’re at it. Last night we made soup. It looked like that. It tasted good. Carrot and Ginger (lots) and Coconut Milk. I like to say Coconut. I have been reading The Salmon of Doubt by Douglas Adams. Its a collection of essays and thoughts and a bit of a story that were all left behind on his many computers. He is funny. I laugh out loud reading his stuff and am sad there will be no more coming. Before soup and light reading the beast that has been happily sleeping since last May woke up. It was a good first meeting and I am excited to see what we can throw together. My personal hope is a flat changing contest, winner gets to say, “Hey I can change a flat tire really fast”, and maybe get some nice tire levers or something. Cody is now certified to teach, I am looking forward to learning. Hooray for Cody! Today I start my month off. Hooray for me! I was spending a bit of my screen time today poking around in the corners of Alastair’s website and I see that you can read his books about his round the world bike ride for free, if you can stand reading a book on a computer or have lots of printer paper. I am happy to have bought both books (I loaned the first book out to someone and I can’t remember who, if it is you, please return my book so Cody can read it and then I can loan it to other people, too!) but you should do what you want to do so if you want to read them but don’t want to pay for them here they are! Get cracking! His website has some great photo slideshows of his trip, too. It is such rousing stuff, I just want to go and take five years and ride around the world. Its not a hard feeling to get over, though. I had a pretty stellar year in the company of Cody and cats! We built a nice sleeping loft in our house. I raced Kent Park and the Dirty Kanza 200 and Chequamegon (finally!) and did a couple of other mountain bike races and read the entire Harry Potter story and we went to Portland, OR by train and went on a three day bike tour on a tandem and I rode lots of long gravel rides this fall and we helped put together Iowa City’s Bike to Work Week and ran two pancake breakfasts to kick it all off and I started my very own weblog and we did lots of volunteering down at the Bike Library and there was so much more. I’m just happy with all of it, riding around the world would be pretty amazing but I like it where I am and am looking forward to seeing what 2008 has in store. I’ll keep you posted! It was a grand weekend at the House O’ G! Friday night was the Bike Library steering committee meeting and while sometimes these affairs can be contentious and even (just once, no charges filed) bloody this time saw all volunteers in good spirits. The BL is ready to rise to even greater heights in 2008! We drank some beers, that was fun. Saturday, our hearts filled with the Wholly Biking Spirit, Cody and I decided to keep it in the big ring and we went down to the Bike Library to work the Saturday shift. It was fun, we moved some product and each fixed up a bike. Not to brag but the bike I fixed up was way bigger than the bike Cody fixed up. I took a picture of it but don’t have it with me, I will present it later for your oh and ah. Here it is then, the Centurion! Yours for $45.00! Saturday afternoon I got really tired and took a nap rather than a ski or a ride. Ah well… Then the mail came! Yipee! It was full of holiday wishes and bills and stuff but also a book that I had ordered about a round the world bike ride! The journey was so long that it required two books to tell the tale and this was the second, I already read the first. It was a great read, covering his boat journey from Cape Town to Rio, the bus ride down to the southern tip of the Americas and his ride North to Alaska. Then it keeps going and tells of the ride over Siberia in the winter (holy crap!) and the fun times in Asia all the way across the continent and through Europe and home. Its a beast of a journey and I highly recommend the book to you all. Sunday was spent reading that book and going for a ride. It had snowed plenty on Saturday and was very pretty. 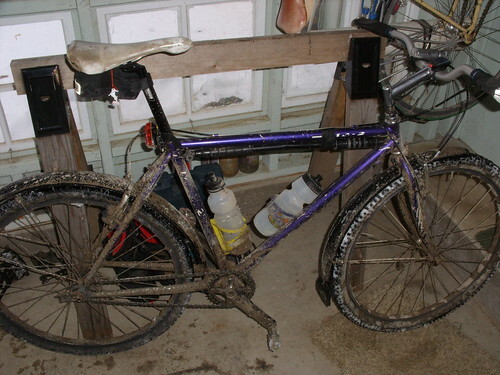 I went out for two and a half hours on the cross bike and explored the gravel. All was well but for a couple of treacherous B roads. The temp was hanging around 20f and that feels a lot warmer than last weekends 10f. It is nice going out to ride gravel and not riding it for 100 miles but I still need two more gravel centuries this year. Feels a lot like work, I wish now I had started this silly challenge earlier in the year. Luckily this is my last week of work so I will crack them out before the calender gets switched. I hope. Will I have that new knobby bike or will the Bridgestone get the call? Only my tax refund knows for sure. The weather has been downed right wintry outside and while I did sneak away for a ride and a ski last weekend all other physical exercise has been limited to townie style slippery and slidery commuting. I told you the weight lifting would not last… Mental exercise has been rampant, however. I have been reading many books. I’d like to tell you about two. 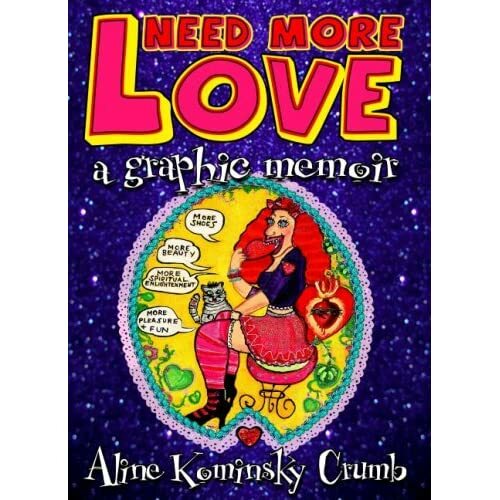 First, Need More Love by Aline Kominsky Crumb. I liked it. The last section featured a lengthy interview with her where she talked about style and shopping and the like and I could have done without that but it was easy to skip it and the rest of the book was a very complete memoir of her life in both the comic and written medium. From growing up on LongGuyland surrounded by mafia style near-do-wells to the peyote infested wilds of the Great American Southwest to California and its burgeoning populations of vinyl-behutted rednecks to the South of France where she lives with her husband you might have heard of. 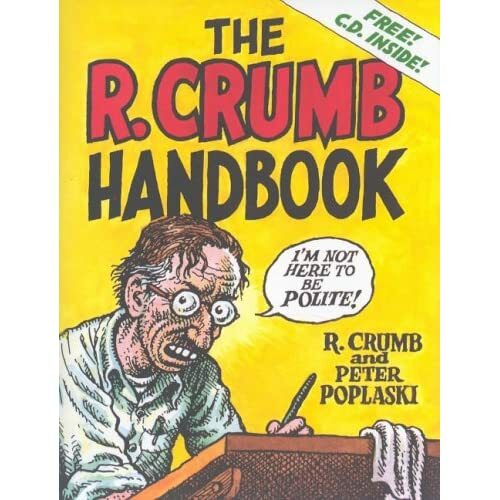 Having been charmed to the point of ordering one of these I decided to continue my Crumb family studies so I took The R. Crumb Handbook by R. Crumb down from our shelf and had a look at it. I have been listening to the free! cd that came with this book since we got it (and it is excellent, by the way) but had not so much as snuck a peak at the book contents. It is much different than Aline’s book and even more satisfying as he speaks not of fashion but sticks to his strengths and tells how his life helped developed them. You might know what the strengths are, I can’t get into them as my mom reads my blog. Hi mom, thanks for reading! As it turns out this book was well worth my time and I recommend it to you, whether you are a Crumb fan who bought Issue #1 of ZAP comics from a hippie in Nevada, IA or you are just hearing of him for the first time.